The “Thuenpha Phuenzhi” or “Four Harmonious Brothers” is a religious painting or fresco often seen on the walls of temples and lhakhangs in Bhutan. It depicts a partridge, rabbit, monkey and elephant one on top of the other in that order. This sacred painting which is supposed to have originated from one of Buddha’s parables is said to have many interpretations but the most common one is this: Once the four beings were arguing about the ownership of a banyan tree. The elephant claimed the tree was his as he had seen it first. The monkey however said it was his as he had been feeding on the tree’s fruits. Next, the rabbit said that he had been feeding on the tree’s leaves since it was a sapling therefore the tree belonged to him. Finally, the partridge said that the tree would not have existed if it had not spat out the seed after taking its fruit. Therefore, all the animals bowed down to the bird considering it their bigger brother. The four animals became friends and decided to share the tree together in peaceful harmony enjoying the tree’s fragrance, the nourishment of the tree’s fruits and the cool shade the tree offered. 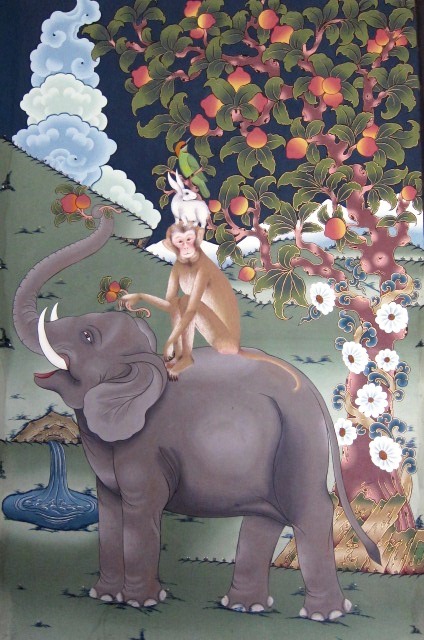 Other animals in the forest often saw them together with the partridge on top of the rabbit who was held up by the monkey who rode on top of the elephant. Henceforth, they were called, the four harmonious brothers. The four animals were looked upon as an example and peace regained in the forest.